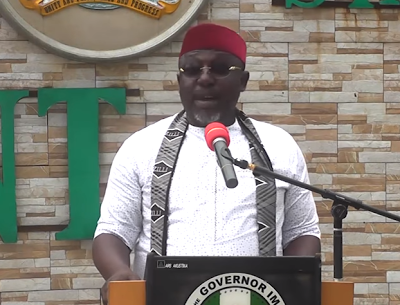 Imo state governor, Rochas Okorocha, has given an explanation on why the May 30th sit-at-home order given by leader of the Indeginous People of Biafra IPOB, was successful. According to Okorocha, the order appeared to be largely successful because most traders in the region decided to take the day off since they had just observed a National holiday, Decmocracy day, just a day before the IPOB order. "Let me correct the impression that the South East supported the seat at home order by IPOB. It is not true. Two factors that contributed to why it looks like there was seeming response to the seat at home order. One, the seat at home order by IPOB came shortly a day after democracy day and our people in their natural characteristic and behavior, would want to enjoy holidays as much as it can be extended. Secondly, the traders had fear all over the country of hoodlums taking advantage of the moment to destroy their goods and properties. So it is not true that the seat at home order was purposely obeyed as a mark of support for IPOB. Those who sat at home was not as a mark of support for IPOB. It was either for fear of being molested or also used that as an excuse to enjoy some extension of the holiday".